Islington residents are set to benefit from the best possible eye care due to the opening of a new suite at City University London's City Sight Clinic. Having offered around 3,600 free eye examinations and contact lens fittings between September and April this year, the partnership between the School and Topcon - a manufacturer of optical equipment for ophthalmology and surveying - will also further position the School as one of the leading optometry education and research institutions in the country, providing a space for students to train with the latest equipment. Based on Bath Street, the City Sight Clinic offers a wide range of eye care services including comprehensive eye examinations using the latest equipment and techniques as well as specialist clinics for adults, children and those with visual impairments and colour vision defects. As a result with the embedded Topcon University Suite the School of Health Sciences will be at the forefront of developments in eye care technology. In addition with Topcon's latest equipment available to trial and loan it will enable undergraduates to practice challenging clinical skills and familiarise themselves with modern equipment that future employers are likely to have in the workplace when they graduate. This will help the School's students go on to become future leaders in their respective fields, ultimately contributing to high quality outcomes for patients. 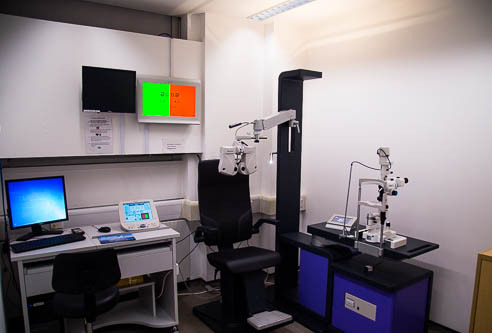 "The new suite will help us to continue to improve eye care in the Islington area as with the new equipment we will be able to examine the eye in even further detail, enabling us to detect and diagnose any eye conditions at the earliest opportunity. The space will also provide students with the latest equipment to train on, helping them to go on and provide the highest quality of eye care." "Combining state-of-the-art facilities and industry leading teaching and research, the School of Health Sciences at City is a place where students, academics practitioners and policy makers can come to learn, share and innovate. "As a result, the launch of this new optometry suite heralds our commitment to the best possible care for the public, education for our students and environment for our academics. Our students, with the interdisciplinary education they will receive, will get access to the latest technology, enabling them to go on and become future leaders in optometry." "Topcon are delighted to announce the opening of our academic excellence suite at City University London's City Sight Clinic. Our partnership will provide an educational and training facility which will be available to all faculty members, undergraduate and post-graduate students, as well as our existing customers and the public. The educational and training facility, part of Topcon University, will have some of the most technologically advanced instruments available on the market today. We believe this investment in the future of tomorrow's optometrists will provide a fantastic platform for the students at City University London to launch their careers in optics."